Below is a list of Treasury hosted events. Full-time members attend all Treasury events for free! To rent our venue for your personal event, please click here. Kami Huddleston and Ashley Bowen Murphy have seen just about everything when it comes to branding blunders and now they’re sharing their secrets to help local female entrepreneurs avoid common mistakes. Join fellow moms who work for an incredible evening of empowerment, inspiration and practical advice. Interested in launching your own nonprofit or business? Do you enjoy multitasking, are a self-starter, or just overall rockstar? Join us and hear from founders of local nonprofits about what it takes to run their organization. Learn from founders and CEOs of local nonprofits on how they made their dreams into a reality- lessons learned, the highs and lows of running your own nonprofit and what they would tell any young professional interested in starting their own organization. The Young Nonprofit Professionals Network of OKC is hosting Ready, Set, Launch at The Treasury and members are invited to attend for free. The Treasury is proud to host March’s CreativeMornings event. Talented local artist Bek Barkocy will speak on the global theme Water. Learn more and register here. Come celebrate International Women's Day with us March 8! Maybe you've mastered marketing yourself or your business from behind the screen, but the real magic for your business is waiting in face-to-face interactions. If you want to learn how to make the most of relationships and turn collaborations into business growth opportunities, come learn from three talented local marketers. Get your ticket here. Maggie Murdock Nichols owns and operates a firm focusing on targeted strategic marketing, creative direction and storytelling. Through experience in the nonprofit sector and corporate marketing, Maggie discovered a gap and realized she had the aptitude to fill it. A connector by nature, Maggie lends this attribute to the benefit of her clients. She has found a balance between business and genuine care that has led to lasting, mutually beneficial partnerships. Vilona Michael owns a strategic marketing agency managing some of the biggest brands, districts and shopping centers in the Oklahoma City area for the past 10 years. Her multi-level approach, which consists of understanding current customers, identifying new target markets, building marketing strategies through innovative, cost-effective ideas and analyzing end-results help companies streamline their marketing efforts. Heather Davis has more than 25 years of experience in real estate sales and is passionate about prioritizing relationships over sales targets to experience success. Degreed in public relationships, Heather has sold more than 700 homes and is known in the industry as a connector and outside-the-box expert. She loves finding specialized ways to market each home while still following the curated marketing plan she creates each year as trends are released. These talented local panelists can speak to the importance of relationship marketing in a variety of industries and situations. 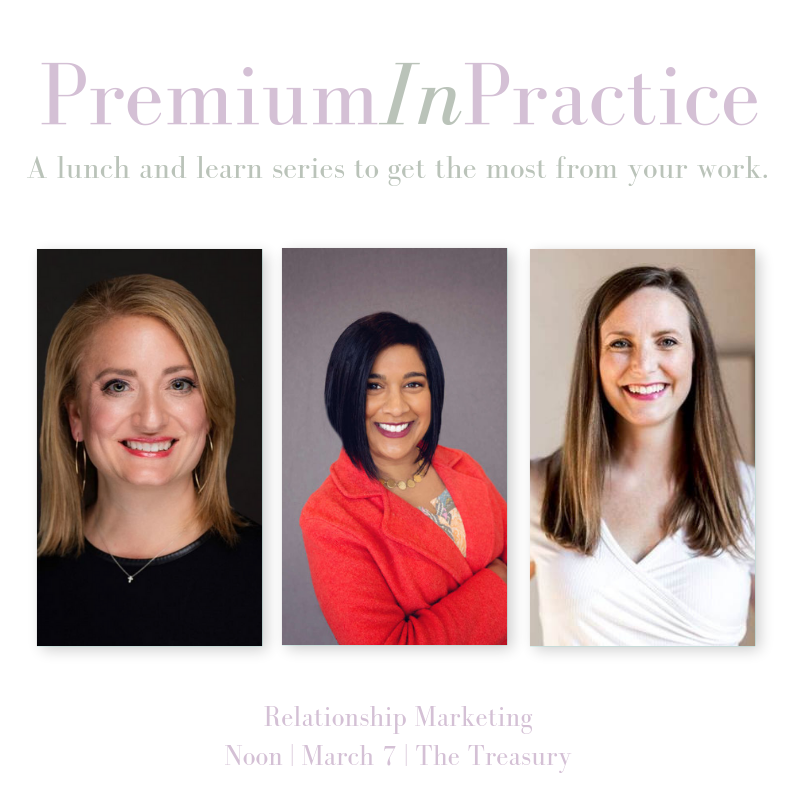 Premium in Practice includes lunch and ample time to ask the panelists specific questions to help you be more productive and profitable at work. The event is $20 (free for Treasury members) and includes lunch. Space is limited and tickets must be purchased in advance. Women are asked too often to separate their home and work lives. The Working Mom Summit is a weekend for women who believe becoming a mom made them better at their jobs. Join us for two days of authentic connections with other local women while we embrace the rich overlap of who we are at work and at home. Enjoy an inspiring keynote, engaging panel discussions, educational breakouts and relationship building with other working moms at this two-day event. Here’s more information, including an itinerary and link to purchase tickets. 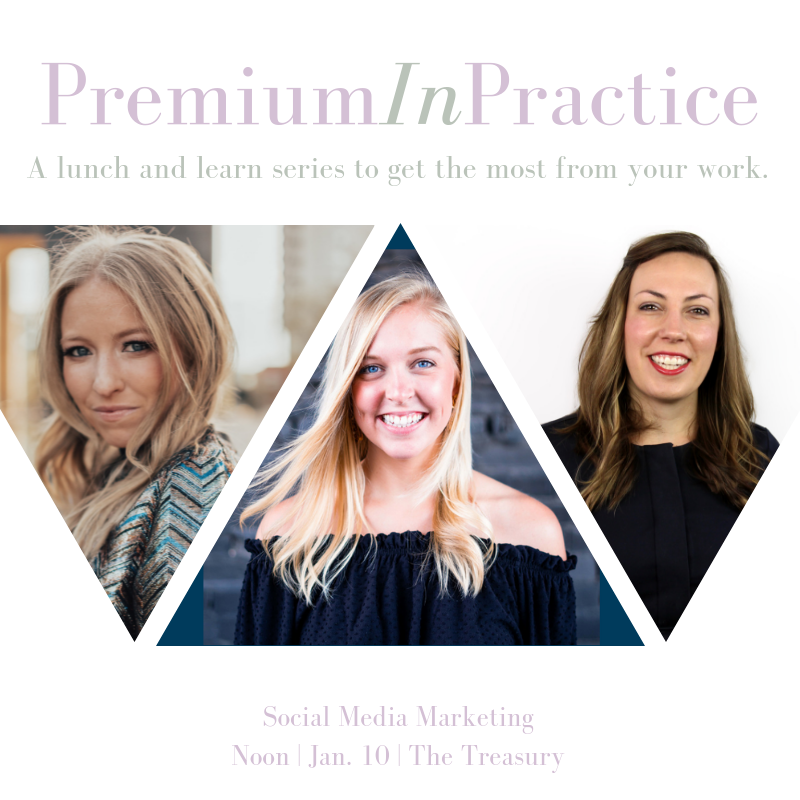 Come ask your burning questions about social media marketing at Premium in Practice, a lunch and learn series to help you get the most from your work. January's event will feature three panelists who are experts and marketing themselves and prominent Oklahoma City businesses on the top social media platforms. Whether you're an influencer looking to brand yourself as an individual or you run social media for a company or organization, the event will offer insight into best practices, tips and tricks for success. Get your ticket here. Antigone LoVoi: As a personal stylist, Antigone used social media to grow her client list, eventually running the Instagram page for high-fashion brand, Alice + Olivia. After that, she launched her blog, See by Antigone. Once her social media following grew quickly over the first year of the blog, more and more people began approaching her for guidance in the social media realm. Eventually, this turned into a consulting business where she takes on clients for a variety of needs from content creation to building relationships with influencers to basic tagging and posting and more. Marek Cornett: Marek is a social media strategist at Koch Communications, a public relations and digital media agency in Oklahoma City. After identifying an opportunity for a previous employer to use social media for their marketing efforts in 2010, Marek fell in love with the ability to connect the offline communities around the brand to the online community she was building. In 2012, she joined Koch Communications as a community manager and has made tweeting part of her daily life since. Bonus fact: Marek met her charming husband on Twitter, so it really is all in the family. Annie Tucker: Annie is the marketing manager for The Social Order Dining Collective, managing the marketing and social media efforts of four restaurants, nine locations and seven different social media accounts. She is also owner/blogger of Take A Bite blog, a lifestyle and food blog. She's a social media addict, work out-aholic, baker, cook, decaf coffee (sue me) drinker, and born-and-bred Sooner. Tickets are $15 (free for Treasury members) and include lunch from Upper Crust. Purchase your ticket here. Entrepreneurs, freelancers and any women looking to ditch the coffee shop for a comfortable, efficient place to work are invited to an Open Coworking day. Enjoy office amenities like fast wifi, coffee, pastries & printing included in your $10 ticket. Get your ticket here. Come see the beautiful building we share with Nominee Design & Sage Realty Partners. 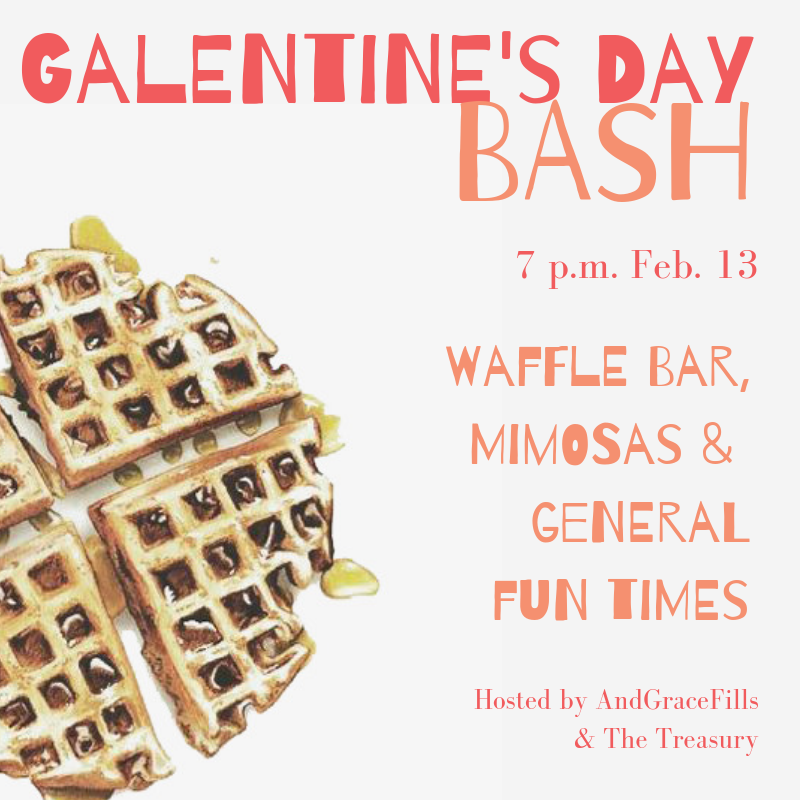 We’ll have snacks, drinks & live music. Women Lead Oklahoma is thrilled to host a conversation with entrepreneur, business owner, and community builder, Aly Cunningham. Aly Cunningham was raised in Enid, Oklahoma and moved to Oklahoma City in 2003, after graduating high school. She spent a few years wandering around college and working minimum wage jobs, until finding herself standing in front of an opened door of opportunity in the restaurant world. She met Shannon and Camille Roper at the original S&B’s Burger Joint while they were planning on opening a few more locations. After five years of opening six locations and learning the ins and outs of restaurant management, she left the corporate world and joined Shannon in founding Happy Plate Concepts, the parent company of the original S&B’s Burger Joint and the sweetest little diner in town- Sunnyside Diner. Since opening the diner in 2016, Cunningham has sponsored close to 1000 necessity bags given to the homeless community through The Sunnyside Street Team, hosts a give and take pantry at each location- with 24/7 access, houses a coat closet at the downtown location, and is already planning the 19th annual Cookie’s Thanksgiving through Other Options Inc, to feed close to 1000 people on Thanksgiving day. In 2018, Sunnyside Diner added two locations to the Happy Plate Concepts family, allowing them to expand their community outreach, such as co-founding Drag Queen Story Hour OKC for kids. This monthly event encourages kids of all ages to be proud of who they are- no matter what that looks like. Cunningham’s role over the years has changed as company needs evolve, however, most days she can be found alongside her team, teaching them to be leaders and providing the friendliest service and a quality of food of which they can be proud. When Aly is not in the restaurants, she can be found dancing in the living room with her wife, Stacey, and trying to keep up with their sweet 16’er, Maya. Trailblazer Tickets are $15 (free admission for Treasury members) and lunch will be provided. Join us for a free community event to meet some awesome locals and enjoy an all-levels flow & meditation taught by Frances Mooney of Hidden Dragon Yoga. Join us for a free community event to meet some awesome locals and enjoy an all-levels flow & meditation taught by Daniela Busciglio, a 200 hr trained teacher of 405 YOGA OKC. Enjoy macarons from Cafe Disco & champagne provided by Bumble Bizz. Entrepreneurs, freelancers and any women looking to ditch the coffee shop for a comfortable, efficient place to work is invited to an Open Coworking day. Enjoy office amenities like fast wifi, free coffee & printing.